Incidence of upper cervical vertebra injuries in elder population augments in accordance with the increase in mean life expectancy of the general population. These injuries can be easily misdiagnosed since they can be caused by low-accelerated traumas due to the osteo-degenerative changes in elderly patients, and with generally no neurological findings. Odontoid fractures are the most common among these injuries. Treatment algorithms of odontoid fractures are not still well established because of preexisted co-morbidities and high rates of morbidity and mortality in older individuals. We have retrospectively evaluated 16 cases admitted to our clinic in last 3 years, which were older than 65 years of age and which have been diagnosed with C2 fractures. In 13 of these cases (81.3%) odontoid fractures (10 cases with type II and 3 cases with type III), in 2 cases (12.5%) lateral mass fractures and 1 pars interarticularis fracture were identified. 14 of the patients (87.5%) were treated with medical corsets (7 Halo vests, 7 Minerva braces) and 2 patients (12.5%) had undergone surgery. All patients who had rigid cervical immobilization (RCI) were discharged in cured conditions whereas 2 patients, who were treated with surgical intervention, had died in early post-operative period. In patients with RCI bone fusion rate was 63.6% and recovery with stable fibrosis rate was 36.4% for odontoid fractures. At the end of the medical corset application period, all patients were checked with dynamic X-ray imaging and in an unrelated manner to the bone fusion rates no instability, greater than 1 mm, was determined. In the mean follow-up period of 30 months, no complications were seen after the medical corset application for stabilizations. Therefore, we have the conclusion that in patients from the older population, with no certain indications for surgery, a suitable RCI should be tried at first, and recovery with a stable fibrosis can be adequate for this patient group. Incidence of upper cervical vertebra injuries in elder population augments in accordance with the increase in mean life expectancy of the general population . Upper cervical injury rate in the geriatric population is reported as 69%, whereas in younger population it is 36% according to the literature . And even according to the publication of Daniels et al. in patients older than the age of 84, in 2014, the number of C2 fractures was reported to increase 3 times in the period of 2000-2010; and the expenditures caused by those injuries were also raised 4.7 times and reached up to 1.5 billion USD . In upper cervical injuries which are not so rare to see in elderly population, Type II odontoid fractures are the most common to occur [4,5]. This kind of fractures which are originated from osteopenia of the joints of upper cervical vertebrae, can be seen easily after low-energy traumas, like mild hyperextension-hyper flexion forces, due to high-mobility of this region and more frequent degenerative changes in older ages [6-8]. In small series of Lakshmanan et al. a possible relation between upper cervical spinal degeneration and type II odontoid fractures has been published . After this kind of low-energy traumas majority of the patients remain neurologically intact and because of the anterior and posterior degenerative changes, standard X-rays are insufficient for diagnosis; therefore these fractures can be easily misdiagnosed [10,11]. Saltzherr et al. divided their patients with cervical injuries into low-risk and high-risk groups; and if the patient was older than 64 years of age, the patient was directly classified as high-risk and the need for a detailed work up was underlined . Also it is known that if this kind of a fracture is left undiagnosed it may have consequences with very severe disabilities which can even lead to mortality. Therefore in this age group of patients, many of the authors suggest to have a CT-scan if the patient describes any pain in the neck region, independently from the severity of the trauma . But routine MRI scanning is still debatable in upper cervical injuries . Modern day's most sensitive method of imaging for soft tissue injuries in upper cervical spine is accepted to be the MRI, as also shown in the meta-analysis of Muchow et al. In addition it is the only way to have an image for the spinal cord . Even though cervical MRI provides very valuable information about the ligament and spinal cord status, bone marrow oedema, and the disc space evaluation it has limited sensitivity in diagnosing bone tissue and its fractures; and since it is not superior to CT in bone pathologies, a correlated benefit together with CT scan is suggested for the usage of MRI . Because of the high prevalence of co-morbidities, high risk of morbidity and mortality rates in every treatment option and the medical fragility of the elderly population; a treatment algorithm is not well established yet . In recent neurosurgical practice for the treatment of this kind of fractures, rigid cervical collar immobilization (if reduction is needed Halo vest or an equivalent management; if no reduction is needed Minerva brace e.g.) 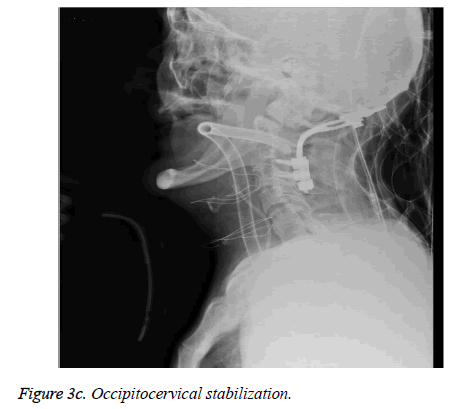 or surgical options (anterior odontoid screwing or posterior occipitocervical stabilization) are preferred. But every treatment option has its own problems or complications, for sure. Therefore, the treatment option which is chosen should aim to cure the patient with minimal challenges. Hereby, we have evaluated the outcomes, complications and treatment options of 16 cases with C2 fractures in a 3-year period at our clinic. Following the institutional ethical committee approval, 97 patients with cervical fractures and/or dislocation, in the period of 2011-2014, were evaluated. Patients older than 64 years of age and diagnosed with C2 fractures after cervical trauma were included; and finally 16 patients were studied according to their diagnoses, treatment options, co-morbidities and treatment outcomes as shown in Table 1. Table 1: Demographic information for the patients. All data about main demographics of the patients and medical histories (age, gender; presence of diabetes, hypertension, hyperlipidaemia, coronary artery disease, chronic obstructive pulmonary disease, osteoporosis and history of dementia), mechanisms of injuries, pre-operative and post-operative imagings and complications were collected from patient records. All diagnostic decisions, treatment options and outcomes were evaluated by the same spinal surgery team as shown in Table 2. Table 2: Treatment and results. In a period of 3 years, 16 (16.4%) of the 97 patients; who were over the age of 64, hospitalized and treated in our clinic for upper cervical injury, had full filled the inclusion criteria. In radiographies of all cases over the age of 64, with upper cervical injuries, osteodegenerative changes were seen in different aspects; therefore, it was hard to conclude a diagnosis just by the result of an X-ray. So patients who defined neck region pain or suspected of cervical trauma, were evaluated with cervical CT scans in addition to radiographies; also 8 patients had cervical MR imagings. In odontoid fractures Anderson and D'Allonzo criteria and in Hangman fractures Levine classification criteria were used [15,16]. 16 patients over the age of 64, with C2 fractures, 10 patients had Type II (62.5%), 3 patients had Type III (18.7%) odontoid fractures, totally 13 patients with odontoid fractures were identified. 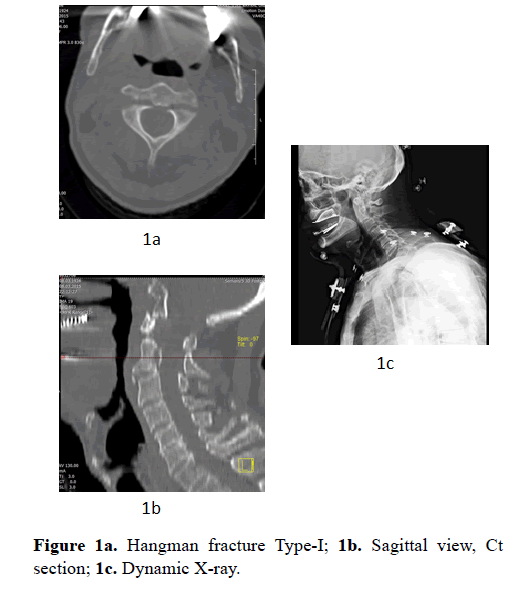 Out of 16 patients, 2 (12.5%) cases had lateral mass fractures and 1 had bilateral isthmic fracture Levine (modified Effendi) classification, Hangman fracture Type-I as shown in Figures 1a, 1b and 1c. 5 of the cases (31.2%) had accompanying C1 fractures. Figure 1: Hangman fracture Type-I; 1b. Sagittal view, Ct section; 1c. Dynamic X-ray. 11 cases (67.8%) had incidents, which can be defined as simple-falls, with low-energy traumas. Only in 2 cases (12.5%) neurological deficits (quadriparesis, difficulty in swallowing) were detected. Rest of the patients was neurologically intact except the complaint of neck region pain as shown in Table 1. Rigid cervical immobilization was performed for the neurologically intact 14 patients (87.5%). In 7 cases which had dislocation above 4.5 mm or angulations, correction was needed; so those cases were treated with Halo vest immobilization as shown in Figure 2a. Figure 2a: Dislocation on sagittal view, CT section. In cases with Type II and III odontoid fractures with a dislocation measurement below 4.5 mm or had no angulations; and in C2 lateral mass and isthmic fractures, RCI was performed with Minerva braces. All RCI performed patients were discharged with recovery. Halo vests and Minerva braces were used for 12-weeks duration. Complications were observed in 2 Halo vest patients (14.3%). In one patient (7.1%) due to pin site infection the pin had to be replaced. The other patient (7.1%) had intolerance to the Halo vest; therefore, Minerva brace was used instead in the second week as shown in Figure 2b. Figure 2b: After Halo vest application, 1-month follow-up, sagittal view, CT section. For the next four weeks, patients were followed with Philadelphia corsets and then without corsets. All cases, which have treated with corset implementation, were controlled with dynamic X-rays at the end of the treatment period, at the 4th month. No instabilities over 1 mm were observed in any cases, with or without bone fusion as shown in Figure 2c. Figure 2c: Dynamic X-ray, 2-years follow-up, no bone fusion, no instability. In our study with a mean follow-up period of 30 months; 7 cases of the 11 patients, who had odontoid fractures and treated with RCI, were observed to have bone fusion (63.6%). Bone fusions were obtained in 4 Halo vest immobilizations (66.6%) and in 3 Minerva brace immobilizations (33%). And in the rest of the cases-2 with lateral mass fractures and 1 patient with pars interarticularis fracture- RCI was achieved by Minerva brace and bone fusion was observed in all three cases. In cases with bone fusion the fact could have been observed after 6 months, in 7 cases. In other 4 cases with odontoid fractures, which were treated with RCI, recovery on stable fibrosis was noted as shown in Table 2 and Figure 2c. One of the two cases with neurological deficits, who had admitted to our hospital one month after the incident, was undiagnosed at the first clinic that evaluated the patient; since the patient had been noted as neurologically intact and no need for further full scans was decided. The other patient with neurological deficits describes a fall during a heart attack, Type-II odontoid fracture could have occurred with this fall or in intubation for resuscitation; when the patient gained consciousness quadriparesis was realized. In those two cases of Type II odontoid fractures (67 and 91 years old) who were conscious, cooperative, had compression on spinal cord with findings of quadriparesis and problems in swallowing; the posterior decompression and occipitocervical stabilization surgery was performed as shown in Figures 3a, 3b and 3c. Both patients died 1 month after the operation due to pulmonary embolism. 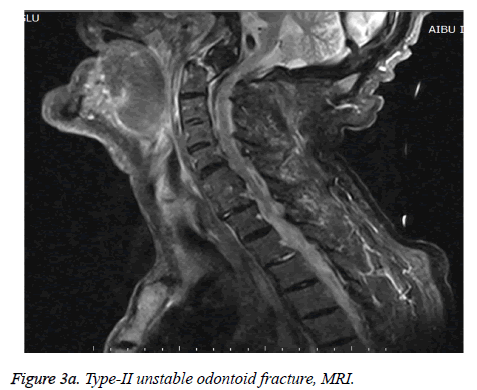 Figure 3a: Type-II unstable odontoid fracture, MRI. Figure 3b: Sagittal view, CT section. As a result of the frequently seen osteodegenerative changes it is hard to diagnose upper cervical region pathologies in elderly population with plain X-rays. Additionally, land-marks needed for diagnoses are disappeared, leading to challenges in diagnosis . Therefore, most of the authors suggest using routine cervical CT scanning in upper cervical traumas of the elderly population [1,2,17]. Having spinal MRI in routine evaluation for high-risk comatose patients is debatable since its low sensitivity in bone tissue imaging and due to the handicaps in monitoring the patient, supplying life-support during the MRI and the transportation. Even though the sensitivity rate of spinal CTscan is reported as 90-100% in some occasions low quality of the images can end up with wrong or insufficient results which may lead to misdiagnoses [18,19]. That's why especially in patients with upper cervical risk and who are not in comatose state, an MRI can supply additional benefits to CT scan. In a couple of studies that were completed in patients with high-risk classification regarding the spinal injury, spinal MRI was found to detect extra lesions in 25% of the cases when compared to CT scans; but those mentioned lesions were defined not to have clinical importance [19,20]. However in geriatric population, Lensing et al. declared that bone marrow oedema in correlation with anamnesis and CT scans can be an important indicator to diagnose the fractures . It is known that simple traumas with low-energy can even cause serious results in geriatric population, so even in simple traumas detailing the examinational options and verification of the diagnosis is needed [6-8]. Diagnoses of all cases in our series were confirmed with cervical CT scans and additional MRI in 8 patients. During the acute trauma phase when MR imagings of 8 cases were evaluated, MRI was found to be efficient in confirmation for the diagnosis of odontoid fractures without dislocation as shown in Figures 4a, 4b and 4c. Because in non-dislocated fractures due to bone tissue artifacts-CT scanning can be inefficient whereas cervical MRI can show findings like bone marrow oedema in T1 sequences as shown in Figure 4c, ligament ruptures, acute bleedings, etc. and therefore it becomes possible to confirm the diagnosis of an odontoid fracture. 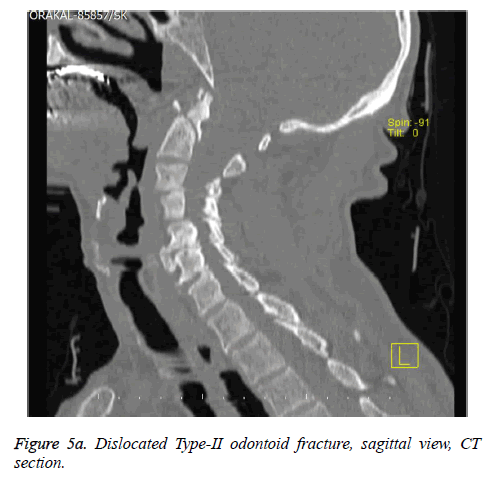 Figure 4a: Uncertain fracture line, non-dislocated Type-II odontoid fracture, sagittal view, CT section. Figure 4b: Sagittal section view, fracture line, on MR T2 image. 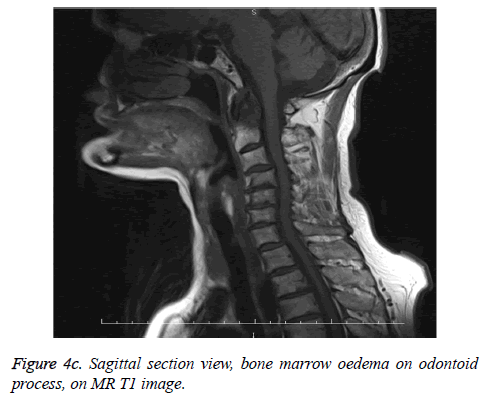 Figure 4c: Sagittal section view, bone marrow oedema on odontoid process, on MR T1 image. In geriatric population odontoid fractures are the most common upper cervical injuries and among those, Type II fractures are the most frequent [4,5]. In our series odontoid fractures compose 81.2% of the study population and 76.9% are seen to be Type II fractures as shown in Table 1. Other fracture types compose 18.8% of the population. According to Anderson and D'Allonzo classification Type-II fractures are defined as the rupture of the odontoid process from the junction of the skull base; and complete stabilization is so important for the treatment of these fractures [15,22]. In elderly population non-union rates for these fractures are reported as 4-85% and mortality rates are reported as 10-57% [7,23]. In meta-analysis by Harrop et al. non-union rates in elderly population was reported as 78% [7,23]. Bone fusion rate in surgical approach is reported to be higher (0% to 65%). On the other hand, even in cases with anterior odontoid screwing, which can achieve complete stabilization with high bone fusion rates, mortality and morbidity ratios are reported to remain too high . In these cases bone fusion is important for the safety of the patient whereas recovery with a stable fibrosis is reported to be efficient in this age group [17,24]. In Koech et al. series with 42 cases, non-union rate with Halo vest was reported as 62.5% and 50% with other cervical stabilizations. Also they claimed to achieve 100% stabilization with Halo vest and 90% with other cervical immobilizations according to the dynamic cervical X-rays . In series of Ryan et al. 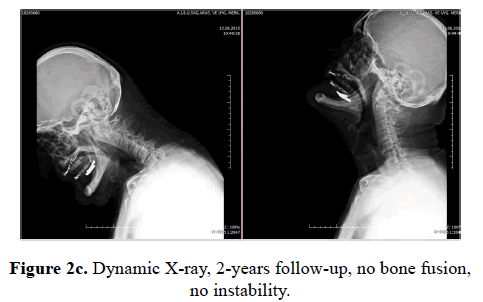 with 30 cases which had odontoid fractures that were treated with rigid cervical immobilization, rates of non-union were 77% but also they declared that no dislocations or neurological deteriorations were detected in 30 months follow-up period . Similarly in their 55.5 months follow-up of 5 patients who were over the age of 81, had non-fused odontoid fractures; Hart et al. reported that they have not observed any myelopathies and dislocations greater than 1 mm, according to dynamic X-ray images . In our case series, bone fusion rate was 63.6% whereas stable fibrosis union rate was 36.4% for odontoid fractures. Bone fusion rate was partially in favour of Halo vest (66.6%) but it should be kept in mind that dislocation rate was higher in Halo vest application. So Halo vest can be argued to be better in odontoid fractures. Also as mentioned above no instabilities greater than 1mm was observed in 24 weeks follow up with cervical dynamic lateral cervical radiographies. Additionally, no neurological deterioration was reported in 30-months follow-up in cases which had recovery with stable fibrosis as shown in Figures 5a, 5b and 5c. Figure 5a: Dislocated Type-II odontoid fracture, sagittal view, CT section. Figure 5b: After Halo vest application, 1-month follow-up, sagittal view, CT section. Figure 5c: Dynamic X-ray, 3-years follow-up, no bone fusion, no instability. We do also think that in this age group union with stable fibrosis is efficient for treatment, without any neurological complications. But on the other hand many authors oppose Halo vest option in geriatric population due to its low tolerability and high frequent possible related pulmonary, cardiac complications [26-29]. Similarly Taitsman et al. 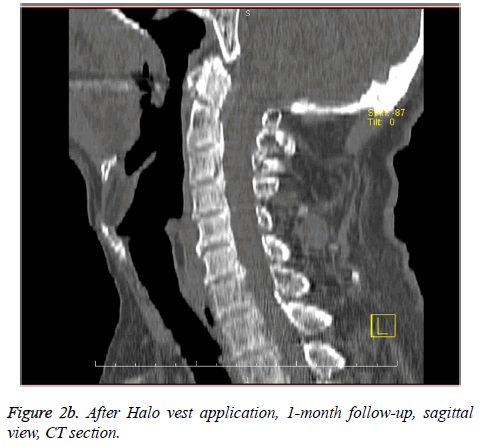 reported that in patients with cervical spinal traumas, over the age of 65, they had observed at least one complication in 55% of the cases which were treated with Halo vest immobilization . Tashjian et al. concluded that, in their 78 cases odontoid fracture series, Halo vest corset application had the highest complication (66%) and mortality rates (42%) when compared to the other treatment options . In our study 7 (50%) cases were treated with Halo vest and 7 (50%) were treated with Minerva brace. In only 2 cases (14.3%) with Halo vest application, complications have occurred. In one of those mentioned two cases, replacement with Minerva brace was carried out in the second week. And in the other patient pins were displaced due to infection on pin site. In none of the patients with Minerva brace a serious problem was observed. In accordance with the literature, when tolerance and achievement in upper cervical fractures with Minerva was evaluated, it was found to be high (6 fusions (85.7%) detected in 7 Minerva applied patients). When only the odontoid fractures were taken into account it was seen to be still successful (3 bone fusions in 4 cases, 75%). But it should not be omitted that in cases with Minerva braces, dislocation rates were lower. Except from certain surgical indications, rigid cervical immobilization should be considered in geriatric patients with upper cervical trauma. Even in odontoid process fractured patients, that bone fusion cannot be achieved, union with stable fibrosis can be efficient. Giving support on cooperation can positively affect the tolerance to the corset application and success of the treatment. And the need to perform an operation, if the non-invasive treatment options fail to treat the fracture, should be explained to the patient in every aspect. Watanabe M, Sakai D, Yamamoto Y, Sato M, Mochida J. Upper cervical spine injuries: age-specific clinical features. J Orthop Sci 2010; 15: 485-492. Daffner RH, Goldberg AL, Evans TC, Hanlon DP, Levy DB. 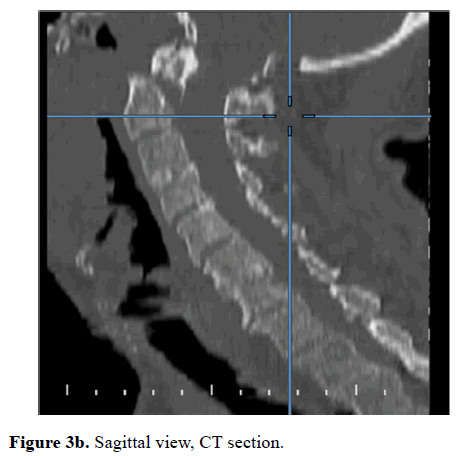 Cervical vertebral injuries in the elderly: a 10-year study. Emerg Radiol 1998; 5: 38-42. Daniels AH, Arthur M, Esmende SM, Vigneswaran H, Palumbo MA. Incidence and cost of treating axis fractures in the United States from 2000 to 2010. Spine 2014; 39: 1498-1505. Dumonski ML, Vaccaro AR. Treatment of odontoid fractures. Neurosurg 2010; 20: 183-188. Smith HE, Kerr SM, Fehlings MG, Chapman J, Maltenfort M, Zavlasky J. Trends in epidemiology and management of type II odontoid fractures: 20-year experience at a model system spine injury tertiary referral center. J spinal dis tech 2010; 23: 501-505. Betsch MW, Blizzard SR, Shinseki MS, Yoo JU. Prevalence of degenerative changes of the atlanto-axial joints. Spine J 2015; 15: 275-280. Harrop JS, Sharan AD, Przybylski GJ. Epidemiolgy of spinal cord injury after acute odontoid fractures. Neurosurg Foc 2000; 8: 1-4. Smith HE, Vaccaro AR, Albert TJ, Hilibrand AS, Harrop J, Fehlings MG. Trends in surgical management for type II odontoid fracture: 20 years of experience at a regional spinal cord injury center. Orthoped 2008; 31: 650. Lakshmanan P, Jones A, Howes J, Lyons K. CT evaluation of the pattern of odontoid fractures in the elderly-relationship to upper cervical spine osteoarthritis. European Spine J 2005; 14: 78-83. Crockard HA, Heilman AE, Stevens JM. Progressive myelopathy secondary to odontoid fractures: clinical, radiological, and surgical features. J neurosurg 1993; 78: 579-586. Vasudevan K, Grossberg J, Spader H, Torabi R, Oyelese A. Age increases the risk of immediate postoperative dysphagia and pneumonia after odontoid screw fixation. Clin neurol neurosurg 2014; 126: 185-189. Saltzherr T, Jin PFK, Beenen L, Vandertop W, Goslings J. Diagnostic imaging of cervical spine injuries following blunt trauma: a review of the literature and practical guideline. Injury 2009; 40: 795-800. Muchow RD, Resnick DK, Abdel MP, Munoz A, Anderson PA. Magnetic resonance imaging (MRI) in the clearance of the cervical spine in blunt trauma: a meta-analysis. J Traum Acu C Surg 2008; 64: 179-189. Maak TG, Grauer JN. The contemporary treatment of odontoid injuries. Spine 2006; 31: 53-60. Anderson LD, Dalonzo RT. Fractures of the odontoid process of the axis. The J Bon Joint Surg 1974; 56: 1663-1674. Levine AM, Edwards C. The management of traumatic spondylolisthesis of the axis. J Bon Joint Surg 1985; 67: 217-226. Ryan M, Henderson J. The epidemiology of fractures and fracture-dislocations of the cervical spine. Injury 1992; 23: 38-40. Blackmore CC, Mann FA, Wilson AJ. 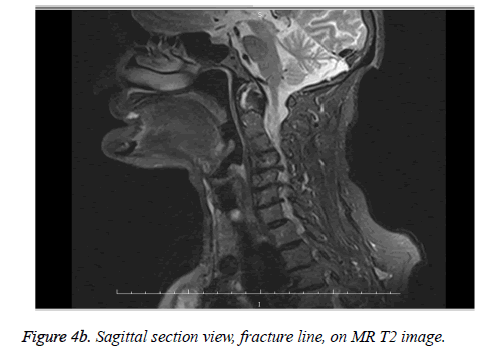 Helical CT in the primary trauma evaluation of the cervical spine: an evidence-based approach. Skele radiol 2000; 29: 632-639. Holmes JF, Mirvis SE, Panacek EA, Hoffman JR, Mower WR, Group N. Variability in computed tomography and magnetic resonance imaging in patients with cervical spine injuries. J Traum Acu C Surg 2002; 53: 524-530. Dalise MD, Benzel EC, Hart BL. Magnetic resonance imaging evaluation of the cervical spine in the comatose or obtunded trauma patient. J Neurosurg Spine 1999; 91: 54-59. Lensing F, Bisson E, Wiggins R, Shah L. Reliability of the STIR Sequence for Acute Type II Odontoid Fractures. American J Neuroradiol 2014; 35: 1642-1646. Hsu WK, Anderson PA. Odontoid fractures: update on management. J Am Acad Orthop Surg 2010; 18: 383-394. Patel AA, Lindsey R, Bessey JT, Chapman J, Rampersaud R, Group STS. Surgical treatment of unstable type II odontoid fractures in skeletally mature individuals. Spine 2010; 35: 209-218. Koech F, Ackland HM, Varma DK, Williamson OD, Malham GM. Nonoperative management of type II odontoid fractures in the elderly. Spine 2008; 33: 2881-2886. Hart R, Saterbak A, Rapp T, Clark C. Nonoperative management of dens fracture nonunion in elderly patients without myelopathy. Spine 2000; 25: 1339-1143. Daentzer D, Flörkemeier T. Conservative treatment of upper cervical spine injuries with the halo vest: an appropriate option for all patients independent of their age? Clinical article. J Neurosurg Spine 2009; 10: 543-550. Tashjian RZ, Majercik S, Biffl WL, Palumbo MA, Cioffi WG. Halo-vest immobilization increases early morbidity and mortality in elderly odontoid fractures. J Traum Acu Care Surg 2006; 60: 199-203. Horn EM, Theodore N, Feiz-Erfan I, Lekovic GP, Dickman CA, Sonntag VK. Complications of halo fixation in the elderly. J Neurosurg Spine 2006; 5: 46-49. Taitsman LA, Altman DT, Hecht AC, Pedlow FX. Complications of cervical halo-vest orthoses in elderly patients. Orthop 2008; 31: 446. Bégué T. Getraum update on research. French Orthop Traum Soc 2010. White AP, Hashimoto R, Norvell DC, Vaccaro AR. Morbidity and mortality related to odontoid fracture surgery in the elderly population. Spine 2010; 35: 146-157. Harris MB, Reichmann WM, Bono CM, Bouchard K, Corbett KL, Warholic N. Mortality in elderly patients after cervical spine fractures. J B Joint Surg 2010; 92: 567-574. Smith HE, Kerr SM, Albert TJ, Harrop JS, Hilibrand AS, Anderson DG. Early Complications of Surgical vs. Conservative Treatment of Isolated Type II Odontoid Fractures in Octogenarians: A Retrospective Cohort Study. Spine J Meet Abstr 2007.